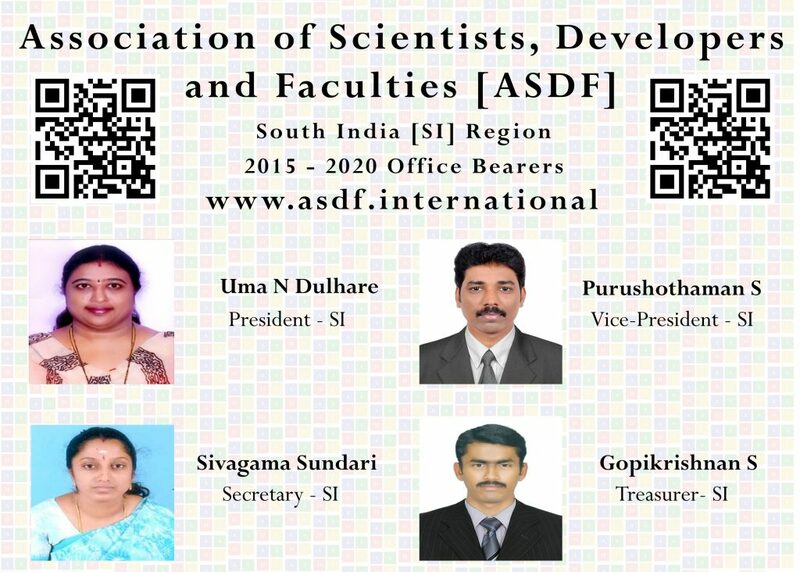 ASDF Headquarters has now announced the new set of Office Bearers South India Region which will be headed by Uma Narsariya Dulhare from 2015 to 2020. Officially announced by the ASDF International President and directed by Office of the International Secretary. Association of Scientists, Developers and Faculties incepted in 2010 has now landed in South India (SI) region with full fledge from January 2015. The Governing Council under the leadership of visionary leader Pr. Dr Anbuoli Parthasarathy has unanimously selected the office bearers of ASDF SI Region which has got resolved in the board with the fullest support. The span of the office bearers from 2015 to 2020 of the South India Region will be headed by Pr. Dr Uma Narsariya Dulhare who is a senior academician with decades of teaching experiences across the world. This SI Region consists of all the South Indian states including Andhra Pradesh, Karnataka, Kerala, Tamil Nadu, Telangana, Puducherry, Lakshadweep and Andaman and Nicobar. The International Secretary Kokula Krishna Hari Kunasekaran has delegated his powers of signing the Industrial, Research, University and Academic Institutes Memorandum of Understandings to the SI Region Secretary Sivagama Sundari Meenakshi Sundaram which needs to witness by the SI Region President Pr. Dr Uma Narsariya Dulhare. The President of ASDF SI Region for the tenure 2015 to 2020 Pr. Dr Uma Narsariya Dulhare is a Professor of Information Technology Department, MJCET, Hyderabad. She has more than 20 years of teaching experience. She served as the Head of CSE Department from 2001 to 2007 and 2009 to 2013 at CJITS. She received her M.Tech from KITS and PhD from Osmania University, Hyderabad, India . The Vice-President of ASDF SI Region for the tenure 2015 to 2020 Purushothaman Seetharrman is a Senior Scientist from ISRO, Bangalore, India. He has over 12 years of research experience in microwave and antenna engineering. He served as a Scientist, VSSC/ISRO, Trivandrum from 2004 to 2010. He is with ISRO, Bangalore since 2010. He received his Bachelor’s degree from Pondicherry University and currently pursuing M.S (by research) leading to PhD from NIT, Trichy, India. He is the recipient of Best- Young Scientist ASDF south award-2016. He also organising Secretary for International conference of Antenna Test measurement Society (ATMS), India. The Secretary of ASDF SI Region for the tenure 2015 to 2020 Sivagama Sundari Meenakshi Sundaram is working as an Assistant Professor of Electrical and Electronics Engineering department at V V College of Engineering, Tisaiyanvilai, Tirunelveli District. She completed B.E. (EEE) from C.S.I. Institute of Technology, Thovalai, M.E. (Power Electronics and Industrial Drives) from Sathyabama University, Chennai, MBA (Finance) from Annamalai University, Chidambaram and pursuing PhD Part-time in the field of Power Electronics at Anna University, Chennai, India. Also, she completed Post Graduate Diploma in Thermal Power Plant Engineering from National Power Training Institute (A Govt. of India Society), Neyveli. She has received University second rank in M.E. (Power Electronics and Industrial Drives) from Sathyabama University, Chennai. She has 10 years of teaching experience and one year of industrial experience. She has more than 40 publications in various national and international journals in the field of Power Electronics and presented more than 47 papers in various national and international conferences. The Treasurer of ASDF SEA Region for the tenure 2015 to 2020 Gopikrishnan Sundaram is an Assistant Professor in the Department of Information Technology, Karpagam College of Engineering, Tamil Nadu, India. He has more than six years of teaching and research experience in computer science and wireless communication engineering. He is with ASDF since 2012. He served as the hospitality chair in ASDF conferences from 2012. He received B.E. degree in Computer Science and Engineering from Anna University, Chennai in 2009. He received M.E. degree in Computer Science and Engineering from Anna University, Chennai in 2012. He has been an External Researcher of Information and Communication Department, the Anna University, Chennai, TN, INDIA, since 2013. The new council has decided to concentrate on University and Government partnerships in establishing Joint Research Activities across the region. ASDF SI would like to give a thrust to research activities across the region by taking up various research studies in all the areas. ASDF SI will also undertake activities to encourage research and innovation within the industry and well as in academia / University. While initiation of ASDF SI Leadership Series will facilitate exclusive interaction between the members of ASDF and industry leaders, at State / National / International level and in turn, provide a platform for exchange of experience and technical know-how, various events will enable the members to get acquainted with the future directions, trends, opportunities and learning across key sectors through lectures by some national & international industry stalwarts. Apart from that, a series of learning and development events will also be organised for the senior leadership team of ASDF HQ & SI members such as CFO’s / Finance Heads, CMO’s / Marketing Heads, HR Heads, CIOs / CTOs / Technology Heads and other key functional heads of the organisation. In the mid of 2017 new events are also about to be rolled out which will happen annually at South India region. This kind of events will discuss the most relevant topics of the uptrends. The International Collaboration will enable the member organisations / bodies to participate in international delegations, both inward and outward, as well as meet people both – nationally and internationally. Schedule for all of these events will be finalised in due course.